CRAZY DISCOUNT! Was: $159.95 Now: $54.97! How annoying it is when bugs mosquitos and flies are buzzing around in your house especially during those hot days in summer! Besides, do you know they are vectors and can transmit a wide range of diseases? 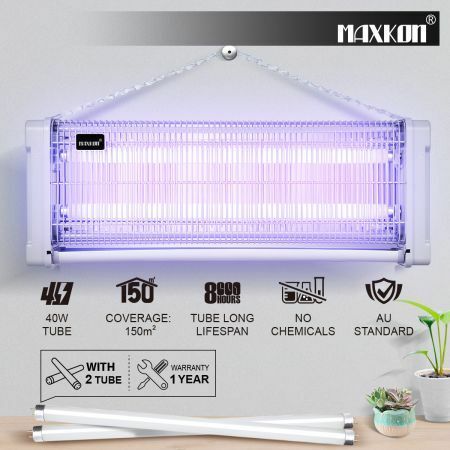 To protect your family from such threat, you will definitely need this Maxkon 40W Insect Killer Eco Mosquito Fly Bug Zapper Electronic Home Pest Control – Grey. 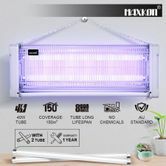 Featuring 2 replaceable 20w ultraviolet bulbs with a shelf life of 8000 hours, this bug zapper attracts all pesky flying insects into the device and kill them once they touch the extremely high-voltage metal grid. Perfect for domestic, commercial and industrial usage, as this cost-effective mosquito trap is capable of getting rid of all flying pests within its coverage area of 150 square meters. With that being said, the cleaning and maintenance is super easy as this eco pest control is equipped with a removable plastic tray for dead insects. Protect your family from diseases. Product just as described. Great seller.